Pitch one starts at the top of the gully separating the table scraps wall from ship rock. Climb an easy slab that wanders right into a steepening water groove and exit onto the ridge through a shallow chimney (5.8). Pitch two consists of basically moving the belay 60' up the scenic ridge to the base of the final pitch (5.5). Pitch three is the money pitch that justifies the mediocre 1st and 2nd pitch. Climb the airy slab through several steep bulges to a crux high step with entire height of the Picnic lunch wall beneath you (5.8). Topping out on the last pitch!! Ever vigilante, the Tico the Cow Dog. coming up the second pitch. Jake leading the first pitch. Whoever took the time to go buy bolts, haul a drill up there, find the line, clean it and put it up for us deserves my most sincere thanks. The position, the views, and the moves of this voyage are phenomenal. All three pitches are lots of fun. I was smiling for three days after I came down from it. That third pitch is as exciting and exposed as the famous 'Panic Point" on the monkey. This is a reasonable good climb. The start of the climb is at the very end of the walkable part of the gully between Table Scraps and the backside of Picnic Lunch Wall. The upper part of the first pitch appears to be skanky, but despite its appearance it was solid. The first pitch is just short of 35m long. The second pitch is harder then 5.2 (as reported in the guidebook) more like 5.4/5 and it is not on top of the ridge but on the right side, giving it really neat exposer. The third pitch is great. Though the high step near the end of the third pitch is considered the crux, I think the first pitch was harder. Thanks for putting this up, Jon. Really a great route with outrageous position considering the difficulty. I ran up this with a friend of mine at the end of a beautiful winter day, and it was just a blast. Definitely a memory I'll hold onto for a while! The exposure on the third pitch is great. I would recommend folks be a bit careful on this route as it is fairly new and some of the rock is still loose; I kicked off a softball sized chunk on P3 and watched it free fall a few hundred feet and land perilously close to the trail. Wowzers is this an epic! First pitch is relatively clean, straightforward, and nothing short of awesome vertical 5.8. Second pitch is nicely protected, short, and 5-easy. Third pitch... well, it still needs some cleaning. A whopper-sized chunk came off in my hand, which had obviously been a primary hold, but was amongst a plethora of other big holds. This may have set the tone for the higher climbing, but my heart was in my throat as I pulled the final bulge. All hardware is solid... just hope the rock is too. The grade in the guidebook is inflated due to the exposure, in my opinion. Just uphill from the top-out is a really nice picnic spot. Fantastic climb with a spectacular 3rd pitch! The rock is also way more solid than you would think just by looking at it, especially on the first pitch. As of June 29th, the right bolt of the lower, beefier bolts (I assume intended to allow a 60m rap) was loose, with the bolt itself wiggling in the hole. Upper set of bolts were solid though, and someone left some pretty fresh-looking 7mm cord with a couple of quick links that could probably be used to rappel for the next few months. Could use actual rappel chains on top. That being said, we climbed with our packs and did the walk off. The bolt protecting the first boulder move out of the perch (great lunch spot) is still there and takes the sketchiness out of what would otherwise be a very precarious move (not hard, just exposed). We initially stayed high as we traversed after the boulder move only to run up against the 10' unprotected down climb. Instead of down climbing we backtracked and scrambled down an easy low-angle slab (fine without a belay although we would have used it if we'd known there was a bolt) and then traversed below the down climb and scrambled back up to where the plaque is located. From here we continued traversing, following a faint use-trail along the top of Picnic Lunch Wall. After the plaque we went high over another jut of rock and did a short scramble down the back side to a wide sandy area full of sagebrush. From here it was a short hike up to the Misery Ridge Trail following a much more distinct use trail. Overall the walk off was fine, but it really does merit more than Alan Watt's one sentence. We climbed it yesterday before the wicked storm hit. The left bolt on both the 1st and 2nd pitch anchors are loose; hole is blown out a bit, and the bolts themselves wiggle a bit. Lots of crispy rock up there still. The spice adds to the overall flavor. Bring two extra draws and link the first two pitches together to save on time. It'll go with a 60 and a bit of drag. Just going to re-iterate most of the comments about the loose holds on P1 and P3. Getting small pebbles rained upon ye ole brain bucket seems to be the thing for P1. P3 has some soft ball to head sized blocks that are loose / hollow and ready to come off - too bad too since they're the obvious jugs for the route. 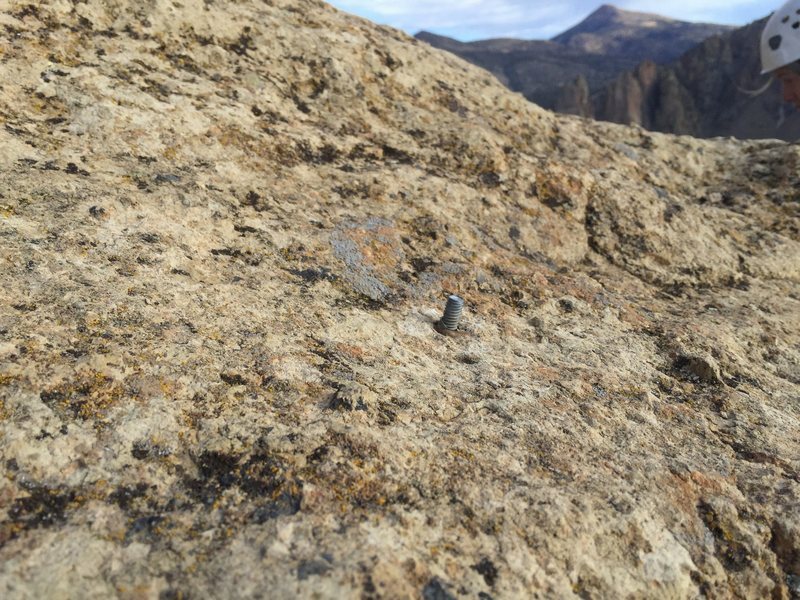 On 8/29/2015 (and again on 10/25 when climbing it again) the left bolt of the P1 anchor was loose. The bolt actually wiggled a bit. It was really windy that day, and some small gravel was being blown down P1 from the dirty ledge above. On normal days, I don't think it would be a problem with a little care. Only other major rockfall concern I experienced would be when rapping P2 back to P1 anchors. Staying rapper's left of the P2 route is a more direct line to the P1 anchors, but has some loose stuff that could be knocked down by feet or when pulling the rope. I didn't notice any terribly loose holds, however. Cool route, and I would certainly climb it again. Based on what C.jake wrote, I'm wondering if he was on the right climb. I'd agree that C.jake's concerns about rock quality are largely unfounded/their reaction is out of proportion to reality. That being said, many of the holds on the first and third pitches are a little creaky and/or have hairline fractures all around them. I agree with anyone who claims the quality of the route is anything less than stellar. There is one softball site block on P3 that's a bit loose, but was chalked and rechalked by myself and my climbing partner on Saturday 9/3/16. The Anchors on top of P1 are a little wobbly, but so long as you don't yank on them straight up, you'll be fine. P1 (5.8) bomber holds and a fun little finish. Worth doing for the last pitch alone. Approach following the nice steps all the way up the gully to the black looking slab, the only bolted line in the area. Link P1 and P2. Pitch 1 seemed mostly cleaned up but still some loose stuff. I only clipped 2 directional bolts on P2 to minimize rope drag. Catdog, there’s a lot of opportunity for the knot in your double rope to snag when you are pulling. BOTH anchor bolts at P1 are loose, not just the hangars. The angle of pull however is perpendicular, so they weren't at risk of ripping out.